Have you ever found yourself browsing Amazon wondering what the pricing history and sales data actually are for the product? 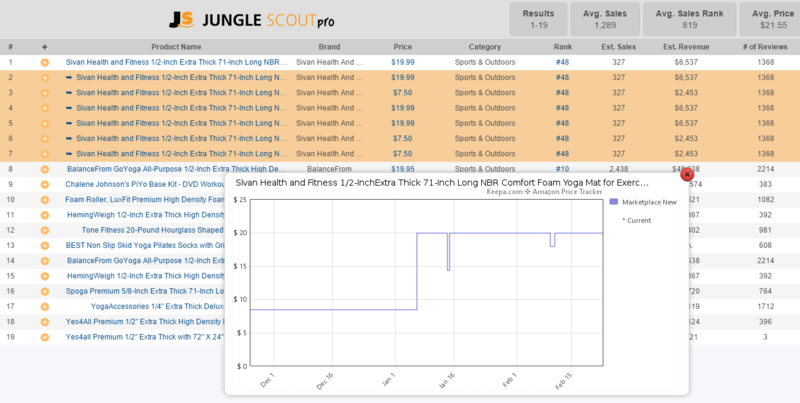 With Jungle Scout Pro, you can click on the Price, and see the high-level pricing changes within the extension. This would help so that you can see the general trends, like the yoga mat example above, where the seller was maybe lowering the price to boost sales and BSR in anticipation of the Jan 1st sales bump for fitness-related products. However, there are more data points that are important to take into account to get a more holistic view. This data includes the Best Seller Rank, Price, Units Sold, Inventory in stock, and more. We quietly rolled out a very cool feature a few weeks ago: people who own Jungle Scout Pro and a Web App membership can now add products directly to the Product Tracker from Jungle Scout. How can you leverage this? Now, while browsing Amazon and cross-referencing data accumulated in the Product Tracker, you get a more robust view of a product’s sales history. The extension is great for getting a snapshot in time: what is the current Best Seller Rank, how many reviews, and what are the estimated sales per month? However, as the Jungle Scout estimate for monthly sales is based off the Best Seller Rank, and a product’s BSR may fluctuate wildly from day to day, so ideally you want to get a more well-rounded look at the product’s history. I like to think of it as viewing the sales data as “lines, not dots”, or to put another way, as a movie instead of a snapshot. 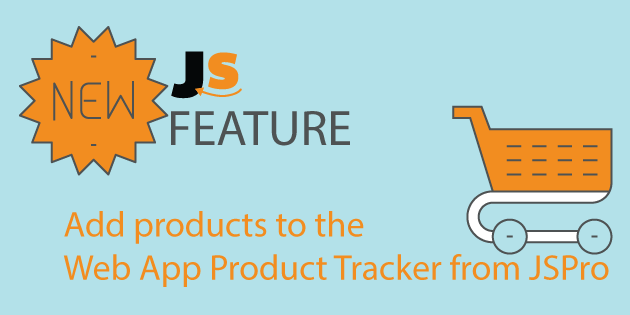 However you see it, with the ability to add directly to the Product Tracker from Jungle Scout Pro, sellers can be better informed about the product and niche they are researching. Releasing this feature is exciting to me because it is bridging the gap between two powerful product research tools, so ultimately your Amazon product research is faster, more efficient, and driven by more data. So if we see an increase in productivity AND profits, I consider that a win-win! Like I mentioned, you do have to have both Jungle Scout Pro and the Web App. If you have either, you can simply log in to your dashboard and complete the puzzle. Level up your Amazon product research today! Nice article. When tracking products is it best to add multiple listings for the same keyword to the tracker, say 4 or 5? Or is it best to just track one product listing, eg, the one that comes up in the Web App? The more the better always. Use the Tracker’s listing building functionality to follow multiple within a certain category that you create. i just bought the jungle scout pro and then few days later I bought the web app I cant figure out how to integrate it can someone help me ? Hi I will like to find out how accurate is the product tracker ? How is the data generated at the backend ? Sure thing, we covered this in depth in this post, hope that it helps! Thanks for the new feature and I think I am going to pay it monthly because I can see how many unit they sold everyday and tracking the competitor. Big big issue I found out here is if the inventory was over 999, there is NO WAY we can track how many product its sold per day. It literally show nothing on units sold but ONLY show estimate sales! Are you able to fix it ?? thanks! I am in the middle of product research and the product database stopped working. Any quick help to continue working swiftly would be appreciated. P.S. The Niche Hunter idea is interesting but also not working at my end as no results are being displayed. There is also no button to start applying selected filter. I am contacting you this way as I was unable to locate a “Contact Us” page ans the “support” page only provides FAQs but no option to contact support. I apologize for any inconvenience on your end. Would you mind sending screenshots to support [at] junglescout.com and we can help you out there asap? We’ll get you back to your product research right away! when will arrive the second shipment? I know that this is a few weeks after your comment, but the second shipment has already arrived and selling! Could you please touch on barcodes purchased from providers other than GSI? I find GSI to bit a bit expensive.